Do Hollywood people go around giving out pictures of themselves? It doesn't happen around here in Detroit. If you did try to hand someone a picture of yourself here they would probably say "What the heck is this? Why would I want a picture of you?" but in Hollywood, they probably take your photo, think those things and then throw it away when you aren't looking. Well, our friend here took his headshot one step further and carved it into a pumpkin. 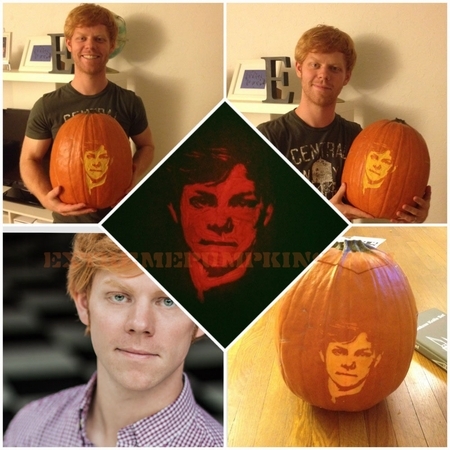 Then he made a sweet photo montage of himself with the pumpkin dead center. It's quite a thing isn't it? Probably wouldn't be a big hit here in Michigan, but maybe on the West Coast people like this kind of thing.